“This is often a figure whenever I present this to an audience that is not too familiar with renewables development where this is some frowning, and people are wondering, because I think these are really remarkable figures,” Lins said last week, with typically Austrian understatement. The reason for solar’s explosion is clear: shrinking costs. 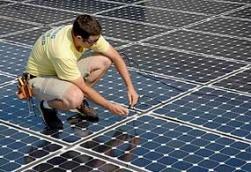 In just one year, 2011, the price of solar PV modules fell by 42 per cent. No wonder Lins called last year a “very special year” for renewable energy. Twidell points out that solar PV has special advantages that other energy generation technologies lack. While wind turbines are themselves falling in costs by around 10 per cent a year, they remain large and quite complex mechanical engines. PV, by contrast, is closer in its technology base to the world of electronics fabrication.”When you look at the various technologies, most of them are spinning a turbine, whereas PV is solid state,” he says. “It’s a completely different cost structure. It’s disruptive in that costs can still go down.” As a result, solar PV appears to be enjoying a cost curve similar to the famous Moore’s Law we see in computer chips.